Author and raconteur Douglas Gibson will present GREAT SCOTS: Canadian Fiction writers with Links to Scotland, from 1867 to Today on Sunday, Nov. 18, as part of the Lorenzo Reading Series at UNB Saint John. After performing more than 200 shows around the world about Canadian authors, Gibson has created this presentation in a PowerPoint format. The lively show involves dozens of excellent Anthony Jenkins caricatures of the selected fiction writers brought to the screen. During the 65-minute show, Gibson takes audience members though history, talking about the pictured storytellers against their historic background. For each author, the show will include a burst of music from his/her time, along with examples of the iconic works of art that were being produced then. 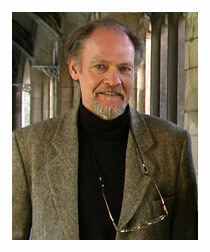 Douglas Gibson is an editor, publisher, writer and raconteur. He was born in Kilmarnock, Scotland in 1943 and raised in Scotland, and arrived in Canada in 1967. He spent his career as an editor and publisher, becoming what the Globe and Mail called "a publishing icon." Douglas Gibson will present on Sunday, Nov. 18, at 2 p.m. at the Saint John Free Public Library at Market Square.